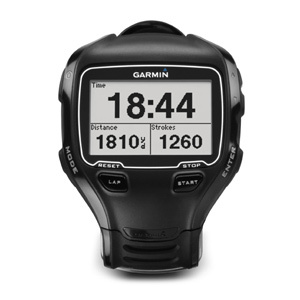 I purchased a very expensive Garmin GPS watch(Garmin Forerunner 910XT) near the end of April 2012. The reason I purchased was because the device was waterproof and could be utilized for running, biking AND SWIMMING. After my first swim with the watch (2 weeks after purchase), it filled with water. (http://flic.kr/s/aHsjzdT13f). Thus my adventures with Garmin support begins. I first eamiled Garmin support and waited. After 24 hrs with no response other than the automated receipt of issue, I called Garmin phone support and got a RMA (Return Merchandise Authorization) but had to ship them the device before they would send the replacement. A process of WEEKS! I only had the watch for 2 weeks and now I would be without for 2 weeks. At what I paid for it, I was not happy and told them this. I use it almost everyday and sold my old Garmin Forerunner (now evaluating the Garmin Fit iPhone App). Garmin did send me a UPS shipping label by email. The same day I tweeted the pictures on Twitter regarding the watch failure and was contacted by their "Social Support" team (@Garmin) to see if they could help. I let them know that I had already called phone support and was getting the exchange but was dissatisfied with the amount of time this would take. Social Support stated a way I could get it quicker and they could do it. I emailed them and said OK, lets do it. Then silence. 24 hours or more until they emailed me asking for a time to call me. I guess I get one email a day. That is the limit. Ugh, what should have been done at FIRST CONTACT is taking days to complete and if Social Support would only email me once a day, this would take another week to complete. Again, back to why I was not happy. These guys work at the slowest pace possible. Even when they are trying to fix the problem of taking to much time. I am getting dizzy. So once again I called phone support to speed things up. They stated they do not offer the opportunity to send a replacement first unless the person contacting asks or complains. I did state originally when I called Garmin I was not happy with the 2 week turnaround. I guess that does not count as complaining. The support person seemed not happy that the Social Support told me of this option. They took my info and said a new Shipping label will be sent to me and the replacement watch will be sent out within a day or two. It has been about 24 hrs since my last contact with Garmin phone support. Still have not received updated shipping label, nor any update regarding the replacement watch. Finally received an email stating that the replacement is on it's way. No tracking number however. It did say they have already updated my registration data on the Garmin.com site. Still have not received replacement. Now am 1 week post swim that started it all. Nor have I received a new shipping label to return. Each day I hope to receive new watch. Here we are, 10 days later and still no new return label from Garmin as stated would be sent by phone support. Since they will not credit me the $400 until they receive the broken unit, this is causing me concern. I went to their support page to create an email support ticket, put in all my info and hit submit and it brought me back to step one. No idea if ticket was created. Will watch email. If I do not get in a few hours, I will call. I am really really getting sick of Garmin's inability to provide any consistant support. Made the phone call. They said I could use the original return UPS label. Great. It is on its way. Although they would have had it already if they said so from beginning.